Elephants, monkeys, curries and so much more!! 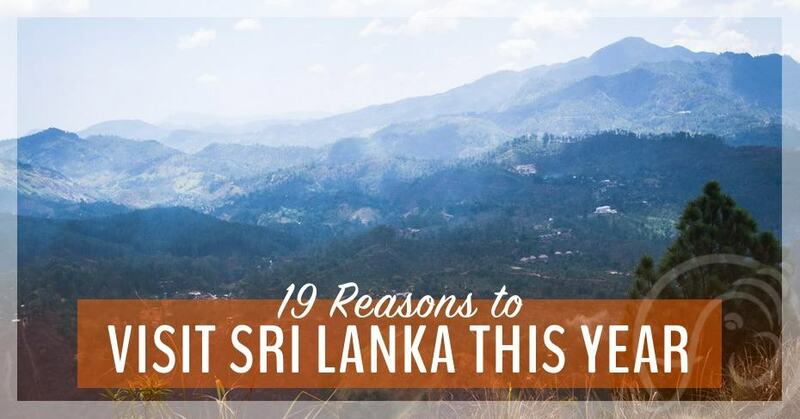 Should you visit Sri Lanka? Until Stephen was invited to teach at a yoga retreat there, I had never even considered a visit to Sri Lanka. To tell the truth, I could barely have found Sri Lanka on a map; the little island nation just wasn’t on my radar. I had absolutely no idea what to expect when we boarded the plane from Chennai to Sri Lanka’s major city, Colombo. Now, after three weeks in Sri Lanka, I realize that we need to go back at our earliest convenience. 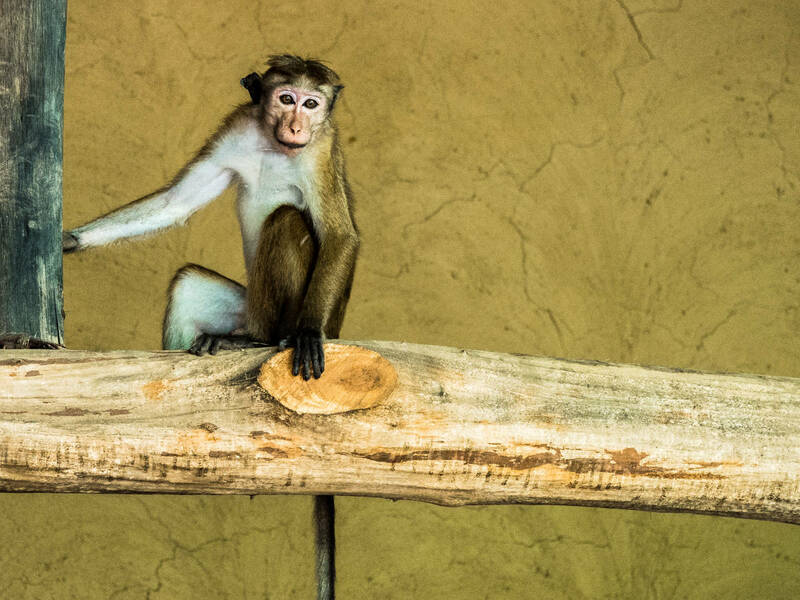 This guy was monkeying around inside a hut at the Ulpotha Yoga Retreat. When you see something every day, it can become commonplace, even boring, right? Well, this has NEVER happened to us when it comes to monkeys. 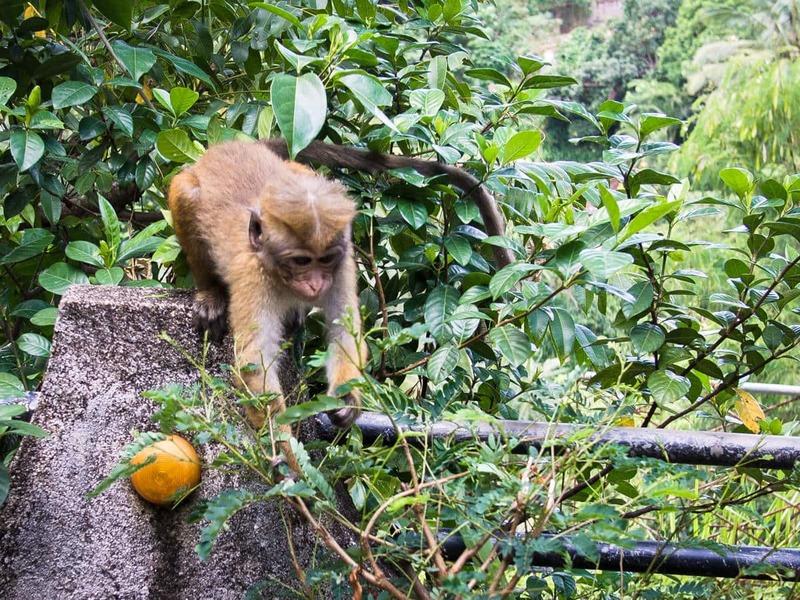 No matter how many monkeys we saw in Sri Lanka (and we saw hundreds), we were always on the lookout for more. Baby monkey in the city of Kandy, Sri Lanka. We were always thrilled to get a little more monkey time in our lives. Who doesn’t love to sit on a train and watch the world sweep by to the rhythm and clatter of the wheels? If you don’t, unfriend me, srsly! 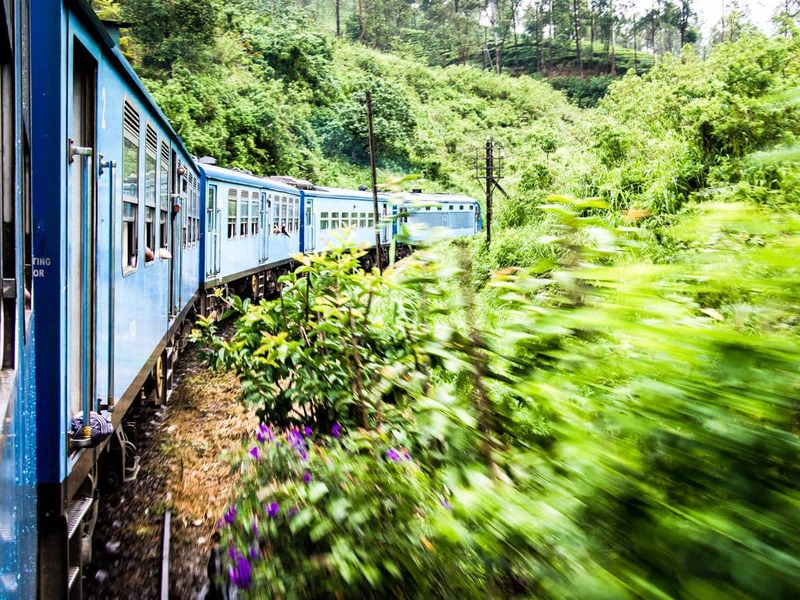 The romance of trains is just one of many reasons to visit Sri Lanka. Sri Lankan trains retain their old-world charm even though most have been modernized enough to be comfy for our spoiled modern bums. 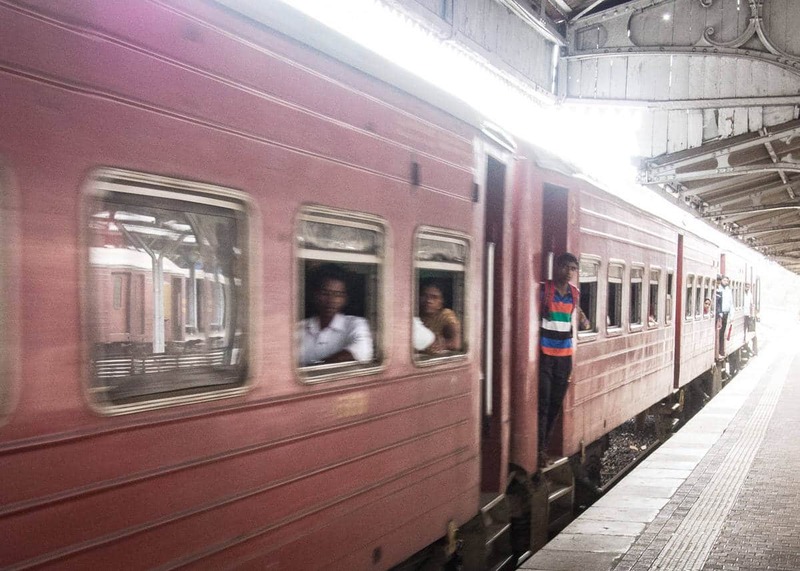 There’s no more romantic way to travel than on the train in Sri Lanka. Some claim the train journey from Kandy to Ella, which we took one misty morning, is one of the world’s most scenic train rides. While we’re not sure about that, it was a fantastic (and inexpensive) way to see the stunning mountains and valleys in Sri Lanka’s interior. How I miss being served daily doses of vegan curry! Literally (well, not literally) the only thing I knew about Sri Lanka before I went there is that it is vegan heaven. The range of freshly prepared vegan curries we had in Sri Lanka was mind-boggling. Most of them included fruits or veggies that I’d never seen before doused in mild, flavourful curry sauces. 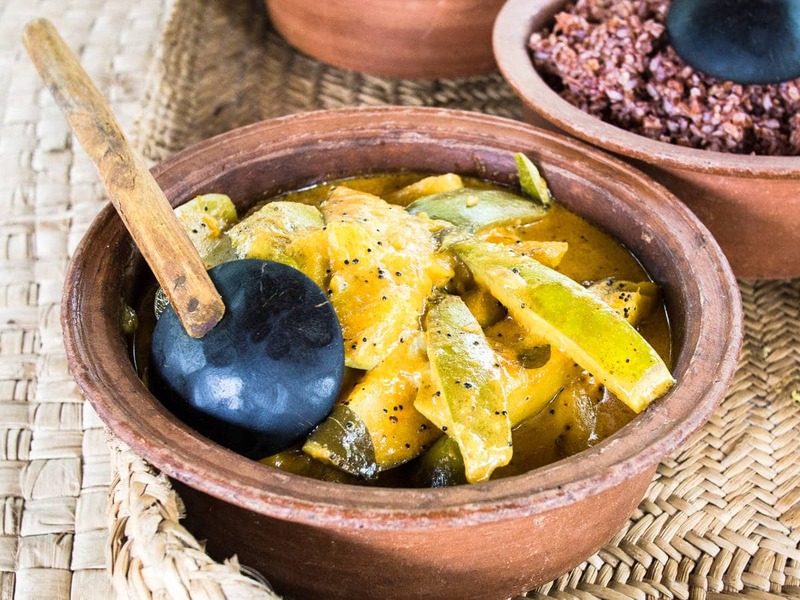 Curries are often accompanied by fresh popadums and other deep-fried yumminess in Sri Lanka. 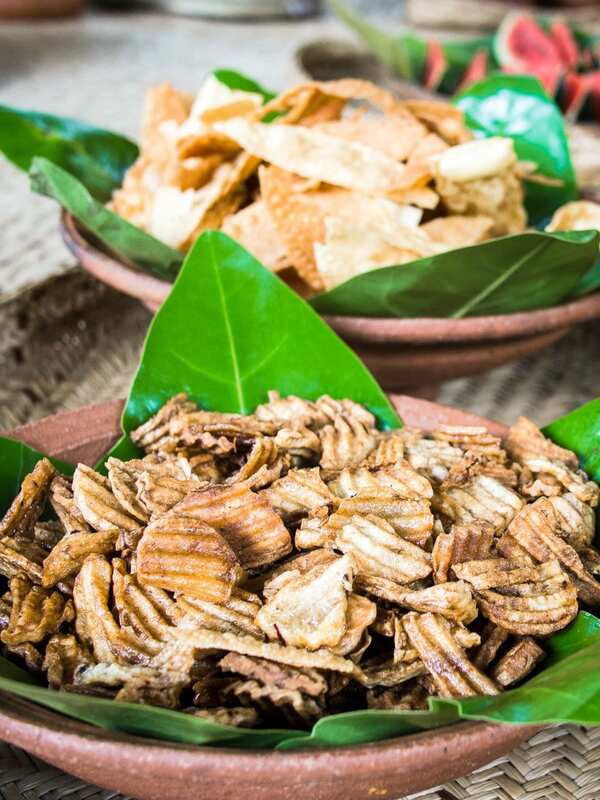 I think I ate my weight in fresh popadums while in Sri Lanka and I still dream of the delicious and inexpensive food. Rice fields in Sri Lanka are the perfect place to strike a pose. Is there anything so beautiful as a bright green rice field, almost ready for harvest? 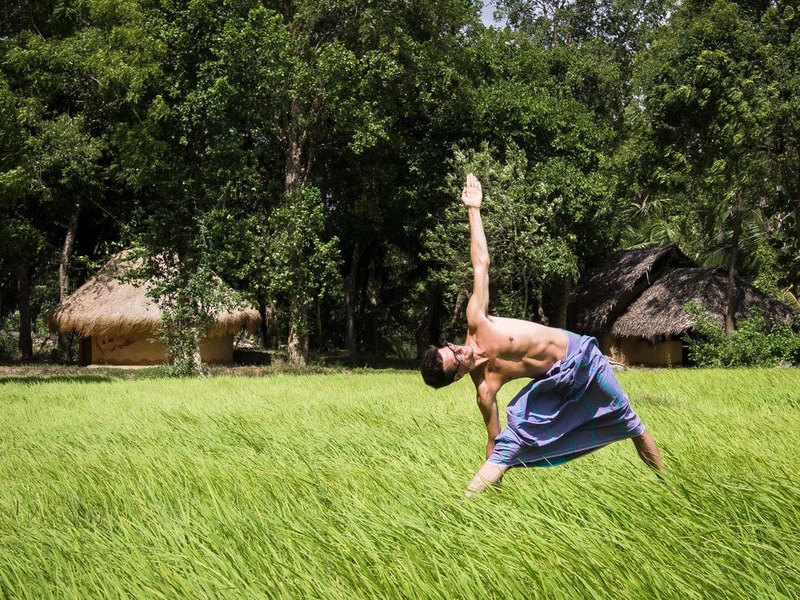 Since rice occupies 34% of the farmland in Sri Lanka, you won’t struggle to find plenty of scenic paddies where you can strike a (yoga) pose for your travel photos. One of Stephen’s favorite Hindu myths is about Hanuman, the monkey god, who leaps from India to Lanka to save Sita from the evil Ravana. We were pretty excited to find out that we could visit the actual cave where the mythical Sita was held captive. 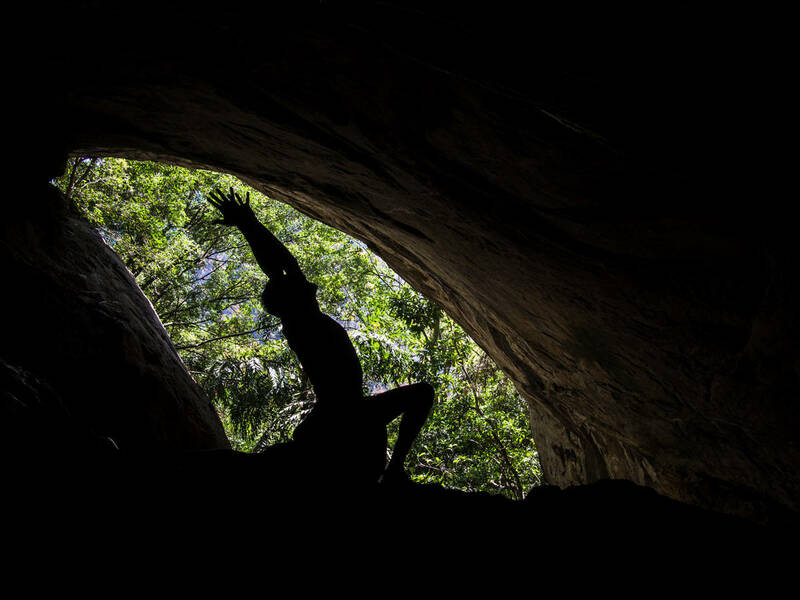 Stephen honoring Hanuman’s great leap with Anjaneyasana in the mouth of Sita’s cave. OK, we know the myths are not real, and therefore, the cave only held an imaginary Sita, but it was still cool to climb the steep staircase up the mountainside and imagine the drama that legendarily unfolded within. 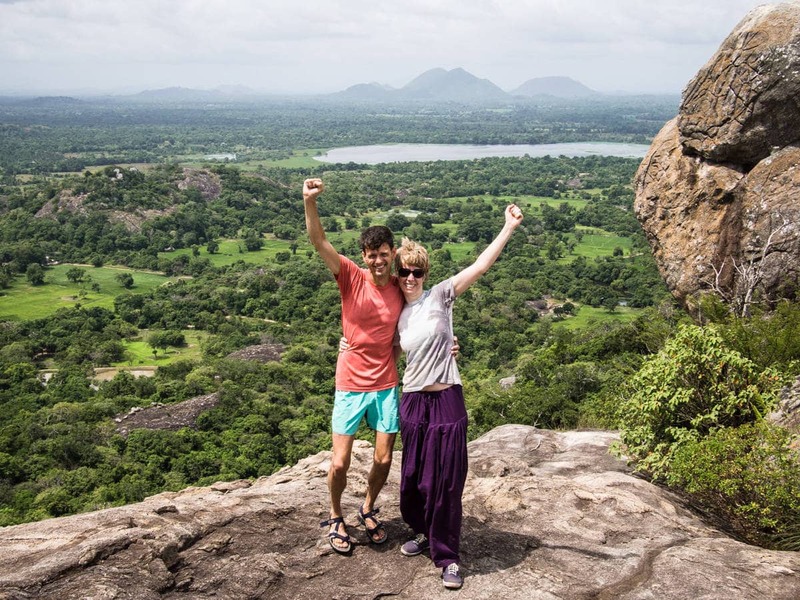 The climb to the ancient rock fortress of Sigiriya was slow, crowded, sweaty – and worth every step. This utterly defensible fortress at the top of a 200 metre-high monolith has been drawing tourists for hundreds of years. These steel stairs at Sigirya may not be ideal for heights-averse travellers. The fortress at the top of Sigiriya is a testament to human ingenuity and our will to push the limits of “possible”. It also provides a damn fine view of the surrounding plain. 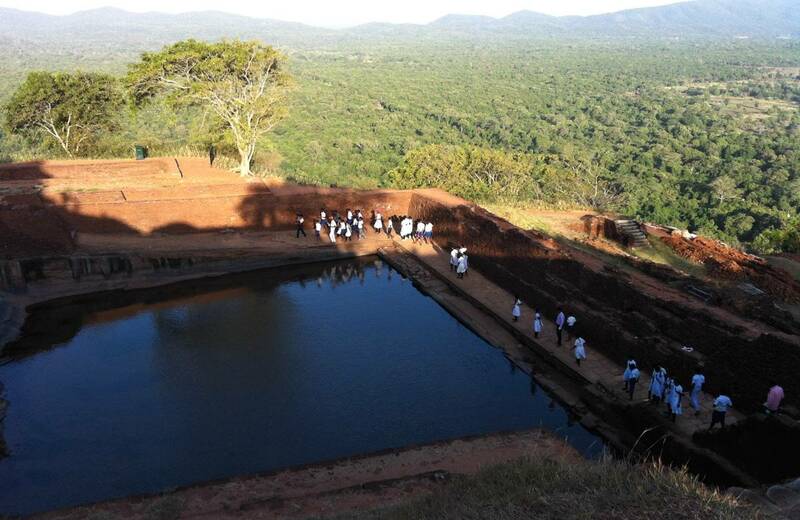 The tanks at the top of Sigirya, a marvel of human ingenuity. 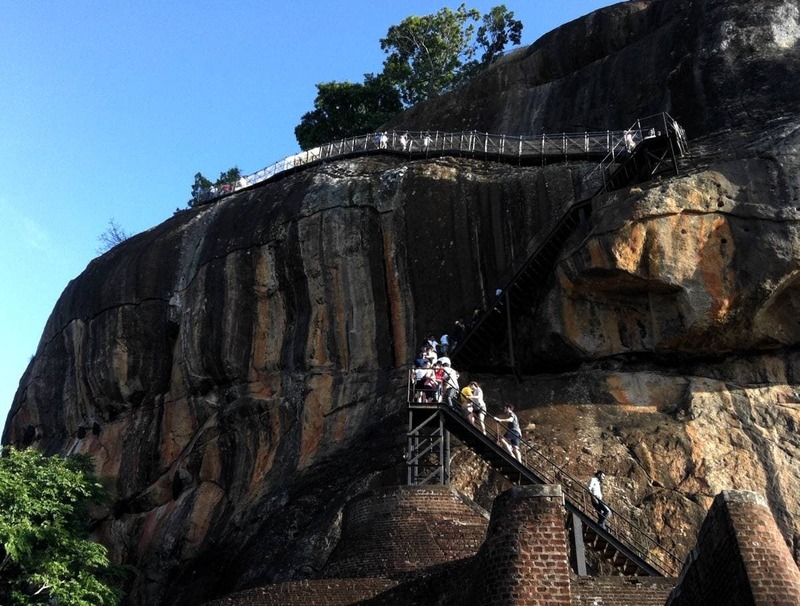 If you really can’t stand the thought of all those people and all those stairs, try climbing Pidurangala Rock instead which is just as beautiful and historically rich as its more famous neighbor. There are eight UNESCO World Heritage Sites in Sri Lanka, including Sigiriya, plus the famous ancient cities of Anuradhapura and Polonnaruwa. 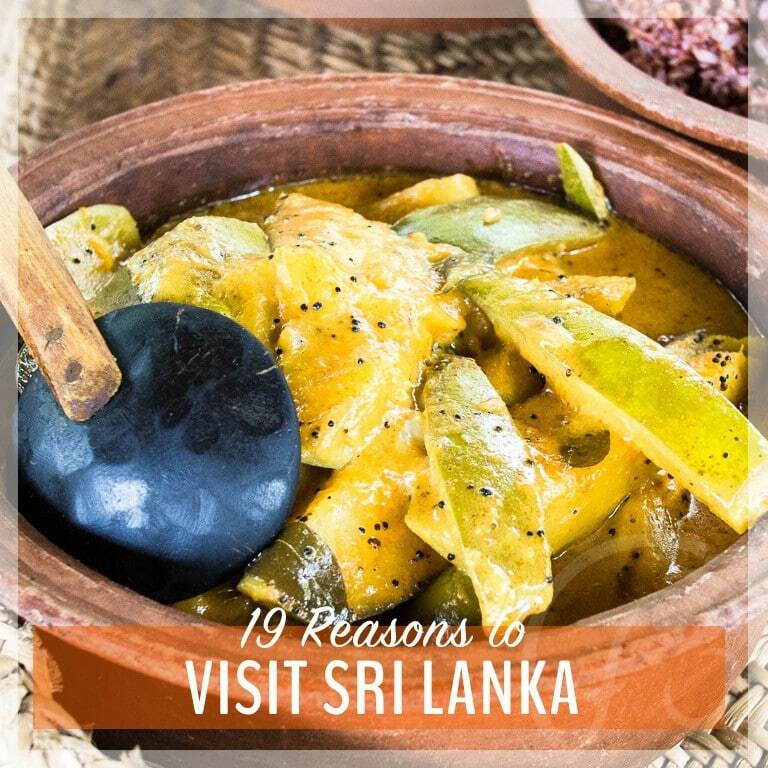 But the Cultural Triangle of Sri Lanka is home to countless monuments, temples and archeological sites of which you and I have never heard. If you want the true off-the-beaten-track experience of Sri Lanka’s cultural heart, pick up a copy of Sigirya and Beyond. A labor of love by the owners of Back of Beyond eco-resorts, this is a hefty travel guide six years in the making. It is filled with advice for travelers who don’t want to stick to the tourist trail, plus hundreds of outstanding photographs. Next time we go to Sri Lanka, I’m going to use this guide as a basis for a very different kind of journey. My love for elephants is bigger than the combined mass of all elephants on Earth. 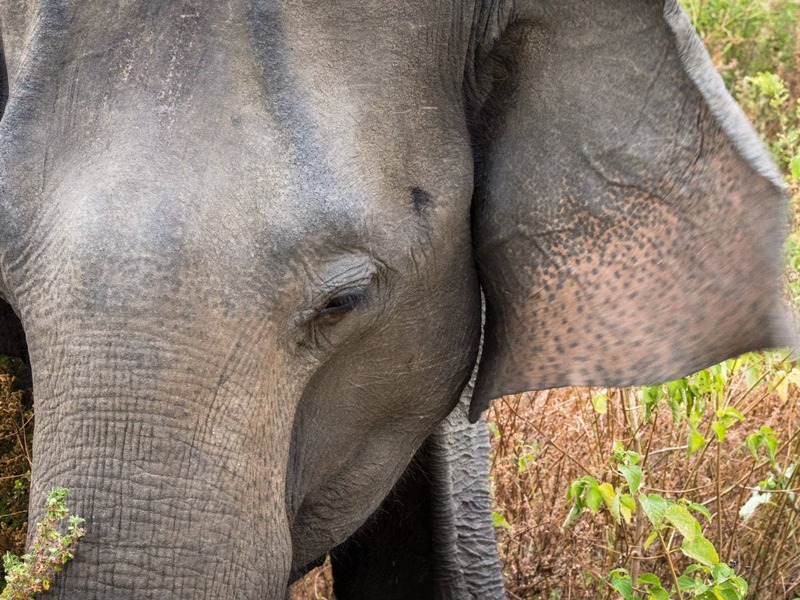 Until now, the only elephants I’ve encountered have been beaten into submission in order to raise money at Hindu temples or on the streets of Thailand. I’ve watched elephants being forced to carry ignorant and/or uncaring tourists on their backs. I’ve seen rescue elephants, victims of past abuse who are too old or too damaged to work for their owners anymore. Wild elephant close-up! Such an amazing experience. That’s why our close encounter with wild elephants in Sri Lanka’s Uda Walawe National Park was such a joy. Elephants abound in (and out) of the national parks in Sri Lanka, and – though there is some concern about over-tourism in a few locations – visiting Sri Lanka’s parks is generally an elephant-friendly way to view these magnificent creatures in their natural habitat doing their independent elephant thing. 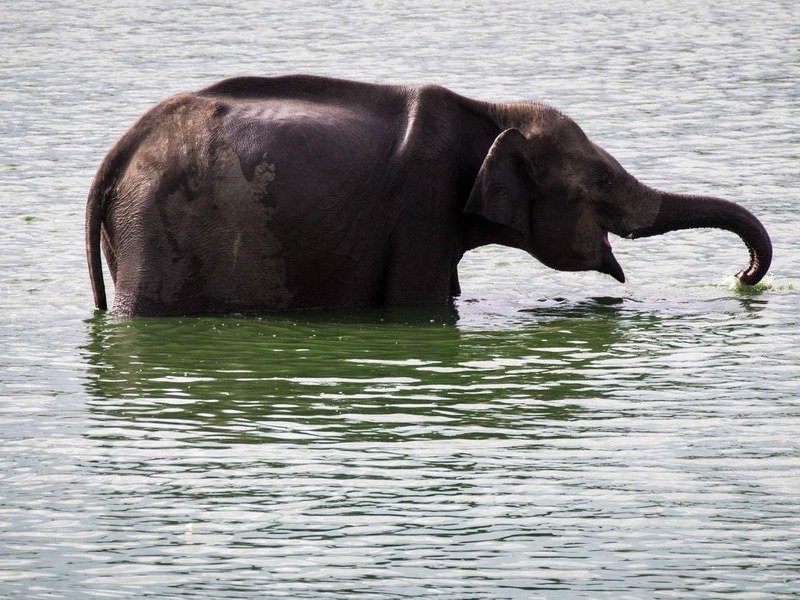 OMG, wild elephants in Sri Lanka doing elephanty things. I could watch for hours! P.S. Please don’t pay money to see elephants who have been taken from the wild and “tamed” or bred in captivity. Please. It is cruel and unusual, and the Earth’s most stately animal does not deserve to be treated like an amusement park ride. I’m not much of a bird watcher, but if I were more like Darwin, Sri Lanka is where I’d come to study our fine feathered friends. 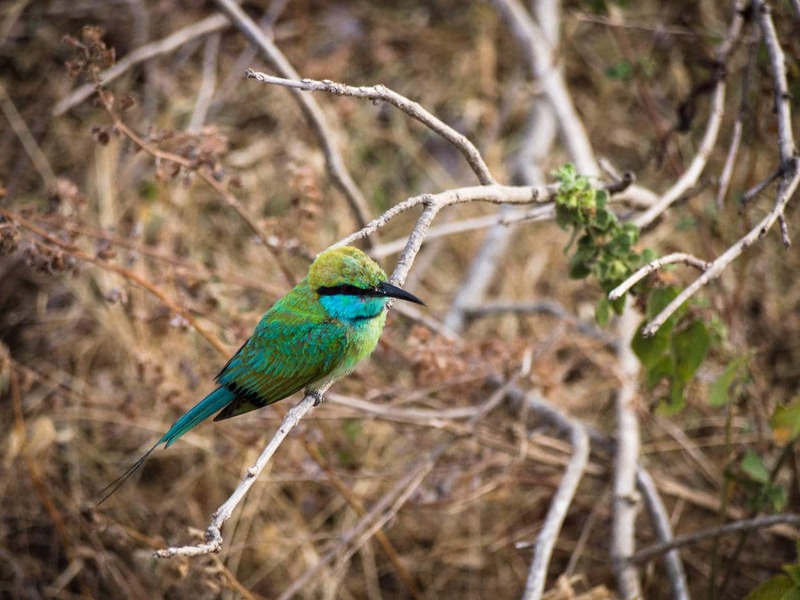 Little Green Bee-eater at Uda Walawe National Park in Sri Lanka. Almost 450 bird species have been recorded in Sri Lanka. We saw Little Green Bee-eaters, Rose-ringed Parakeets, Red-wattled Lapwings, a Malarbar Pied Hornbill (!! ), about 50,000 Peacocks and countless other less flashy species… without even trying. If you’re a bird fan, you’ll have no problem spotting at least some of the 33 unique species on the island, plus an endless flock of migratory birds. Don’t forget your zoom lens! Empty beaches of pure white sand. Endless views of crystal blue water. Powerhouse waves crashing with all the might Mother Nature can muster. Sri Lanka has some of the best beaches in the world. Soothed by the crashing ocean in Sri Lanka. And if you don’t like the beach you’re on, there are hundreds of others to choose from. Perfect half-naked beach shot. Totally Instagram ready! So whether you’re a surfer, a beach babe, or a yogi, pack your bikini and visit Sri Lanka. Your Instagram followers are waiting! Sri Lanka isn’t all beaches and palm trees you know. The spectacular interior of the island is home to historic hill stations and incomparable misty mountain vistas. Who knew Sri Lanka had a such a misty mountainous heart? When the heat of the beach gets a little too much, make the short trek to Sri Lanka’s mountainous heart and cool off at altitude. I used to think that flying to an exotic location half-way around the world to do yoga was a stupid idea. 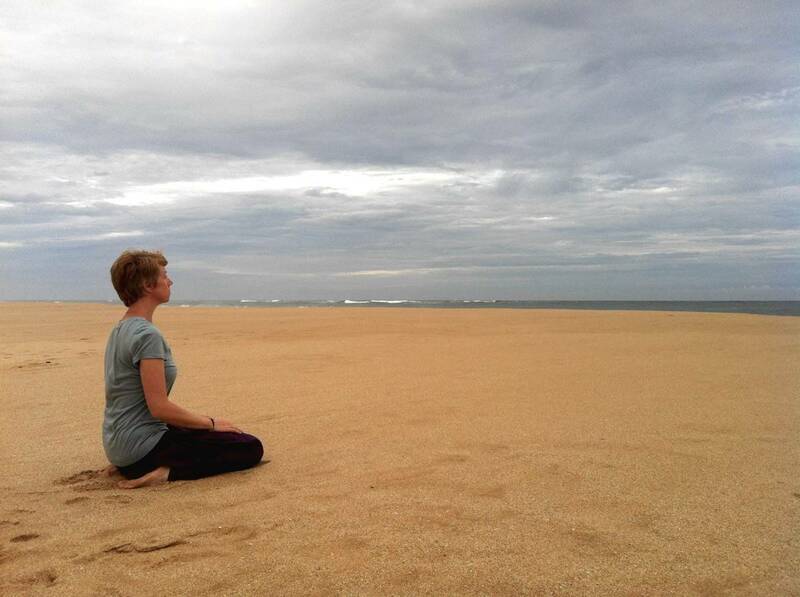 After staying at Ulpotha Yoga Retreat in Sri Lanka for two weeks this summer, call me a convert. 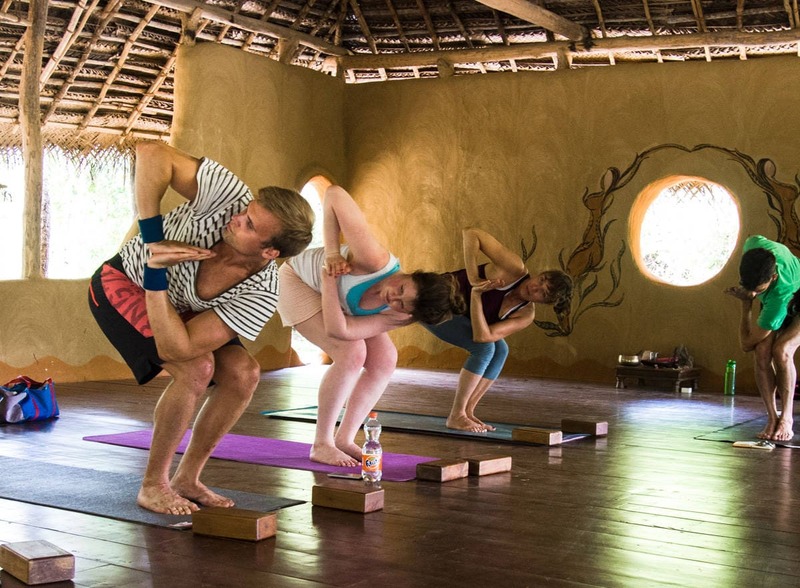 Stephen leads yoga class in a mud hut at Ulpotha, Sri Lanka. Retreating from our plastic, glass, and steel always-on always-connected world is one of the best things I’ve ever experienced. Re-discovering the natural rhythm of life, dictated by sunrise and sunset instead of alarm clocks and electric lights, was such joy that I never wanted to leave. Plus, twice-daily yoga deepened and strengthened my physical and mental practice in ways I never thought possible. 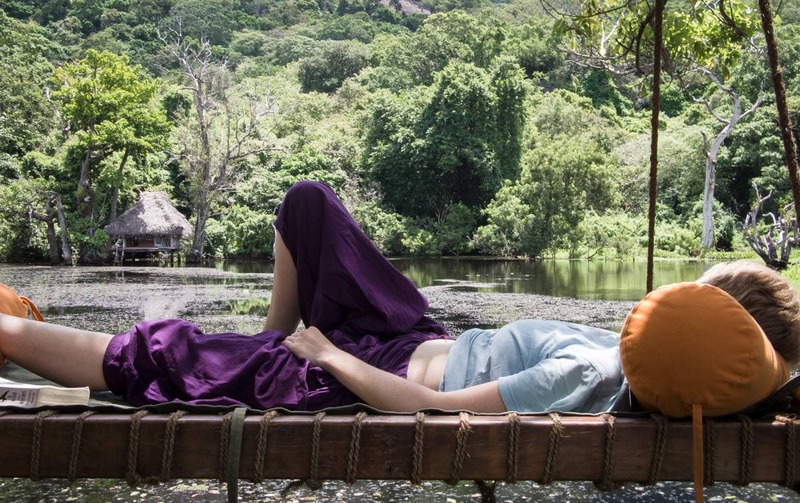 If you need to switch off from the daily grind and reconnect with your mind and body, visit a Sri Lankan yoga retreat. And take me with you! Eco-friendliness is the trend in Sri Lankan resorts these days, and you certainly don’t have to rough it to be green. It’s not uncommon for upscale resorts in Sri Lanka to offer a Superior Tree House or a Deluxe Mud Hut. Garden-grown and jungle-foraged produce frequently makes an appearance on the dinner table and solar panels provide green electricity. At Back of Beyond Kahadamodara, where we stayed on the south coast, the landscape around their sustainably built villas is left as untouched and wild as possible. They collect rainwater and store it in man-made lakes for use during the dry season, not only by humans but by wildlife as well. 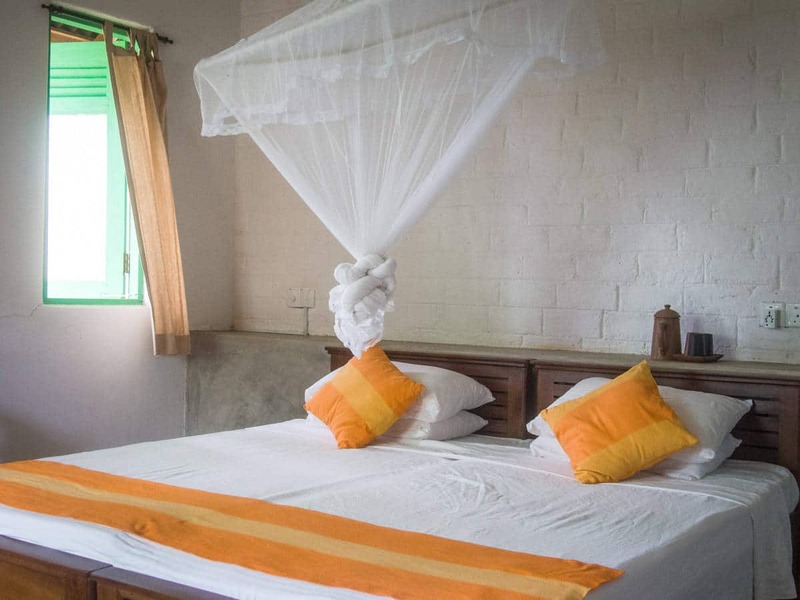 Our simple villa at Back of Beyond was natural and luxurious at the same time. Their properties are solar powered and there is no air conditioning. Buildings are cooled by natural air flow, and the use of traditional building techniques, like rammed earth walls and thatched roofs. 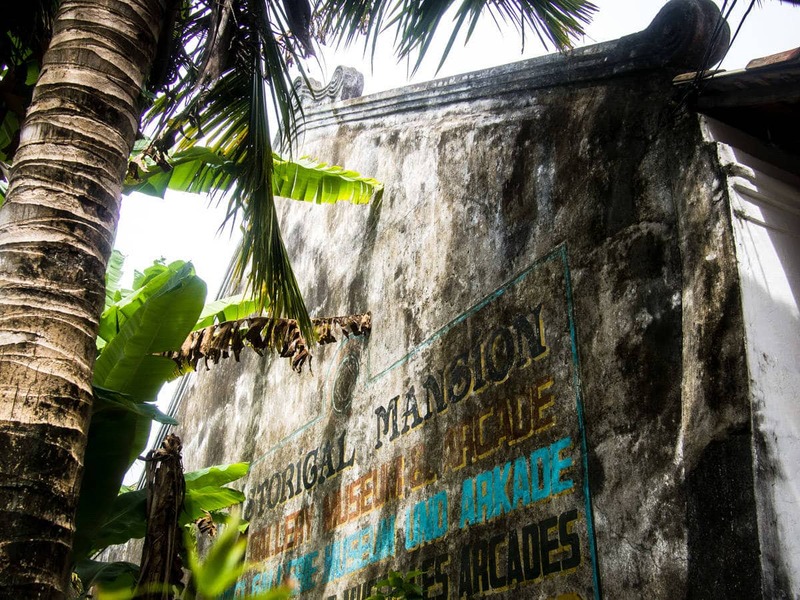 Galle Fort is an atmospheric meeting of the old and the new. I’m a sucker for charming colonial towns (despite the horrors wrapped up in their histories). Galle Fort, on the south coast of Sri Lanka, is one such town. 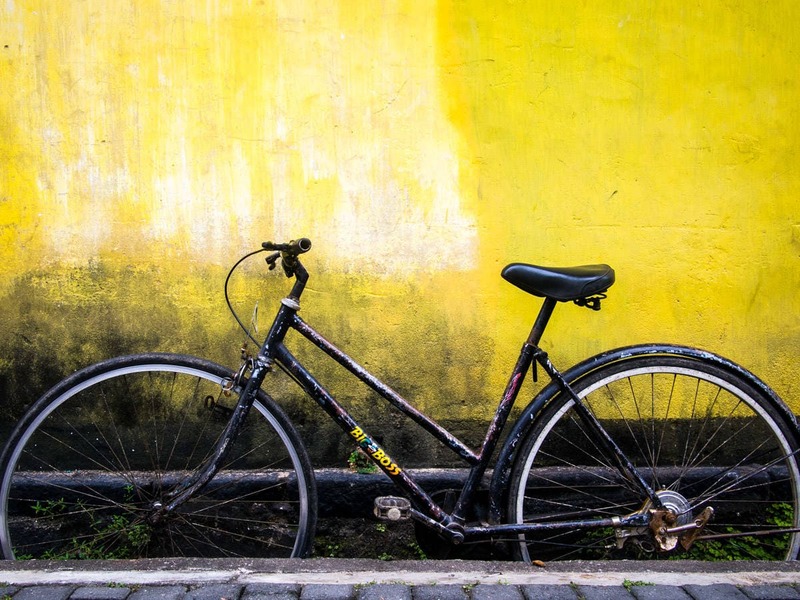 There is eye-candy everywhere you look in Old Town Galle. Protected on three sides by the sort of ocean you usually only get to see on postcards or travel blogs, Galle Fort’s narrow streets are lined with charming guesthouses and artisan gift shops. We don’t really buy things, but it’s always fun to look and plan our future purchases. Animal-loving shoppers should check out Embark, where the proceeds of their dog-themed wares go to helping Sri Lankan street dogs live healthier and better lives. While there are endless sights to see and things to do in Sri Lanka, there’s something about the culture that lends itself to pure relaxation. “Just lying there” is the new “doing stuff”. My kind of holiday. Whether it’s sitting with a book and a cocktail next to the infinity pool, dozing on the beach or staring up at an awe-inspiring field of stars in the sky, Sri Lanka wants you to just sit back and take it easy. Why fight it? If you ever get tired of lazing around, spectacular jungle treks and mountain ascents are within easy reach. Summit shot after a short hike in central Sri Lanka. If you like to see the sunrise, try a nighttime hike up Adam’s Peak. Or climb Ella’s Peak for a heart-pumping ascent to gorgeous views of the valley below. 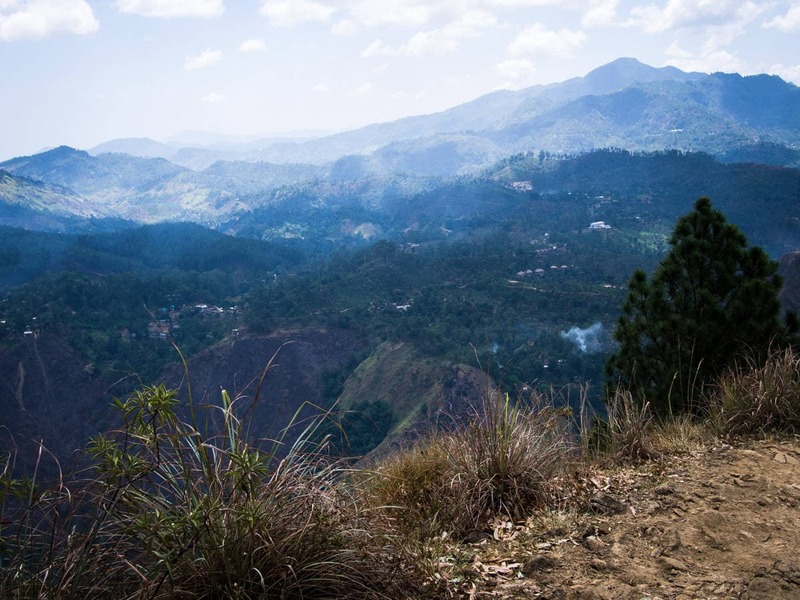 Or take an overnight hike in the Knuckles Mountains to experience a wilder side of Sri Lanka. Forget coconut water packaged in foil-lined non-recyclable boxes. 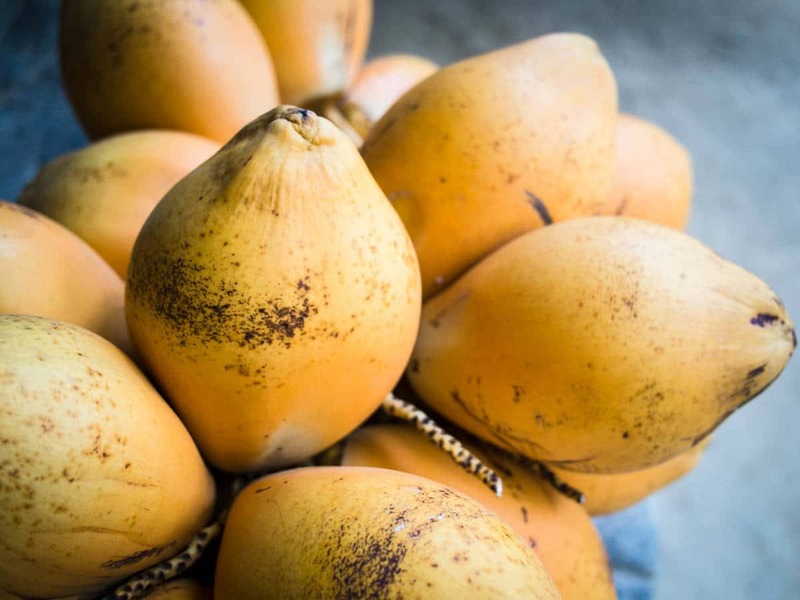 In Sri Lanka, any time you want to grab a refreshing drink, there’s always a fresh coconut nearby. Fresh drinking coconuts are the ultimate hydrator in Sri Lanka. Coconut water is purported to be the ultimate hydration drink. Whether this is true or just pseudo-science, they certainly are a tasty treat in a country where the temperature ranges from “sweaty” to “extremely sweaty”. We expected to be inundated with air conditioning in Sri Lanka, considering the average daytime temperature hovers around 30 degrees Celcius. Instead, we found ourselves living in no-walled huts or mud guest houses with open-air bathrooms and no glass in the windows. The bars are just there to keep the monkeys out in Sri Lanka. 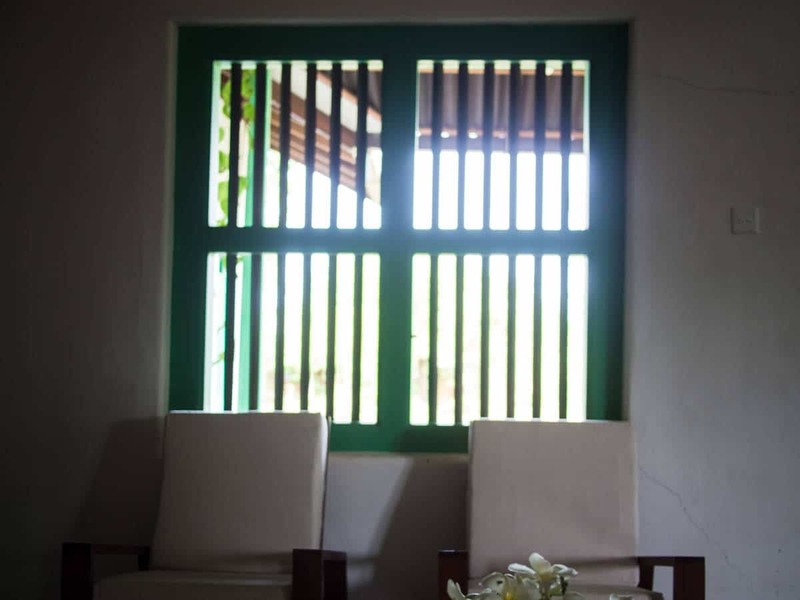 Sri Lankans know how to build their homes to keep it cool indoors, even when the sun is beating down outside. Our cabin at Ulpotha had only one wall. Gorgeous. 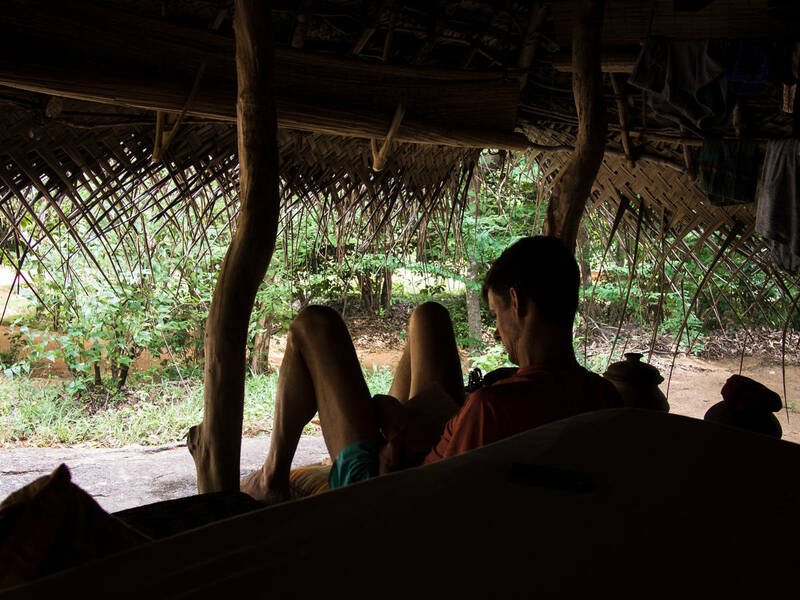 We loved being outside all the time, and our first few nights indoors after leaving Sri Lanka felt claustrophobic and just a little bit wrong – like we’d left our true natures behind. 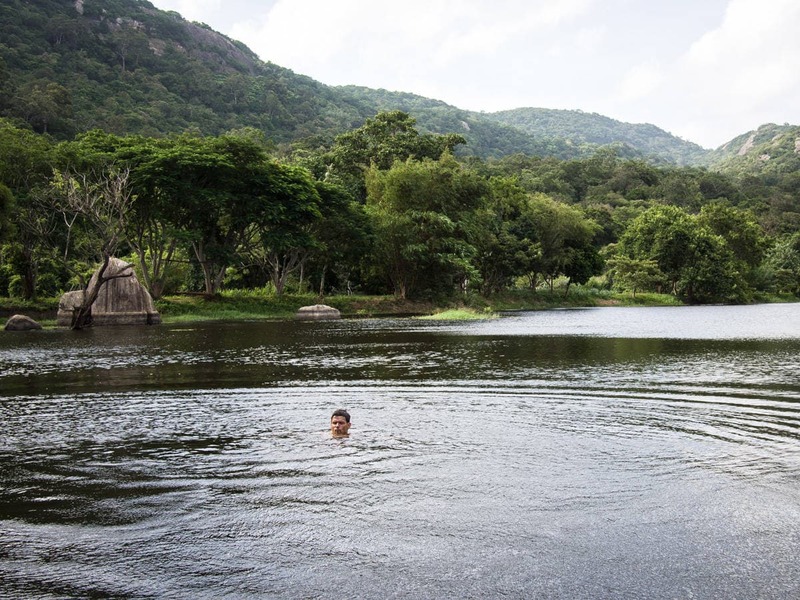 Fresh water swim at Sri Lanka’s Ulpotha retreat. Have you been to Sri Lanka? Are you aching to go back? Leave your thoughts below. 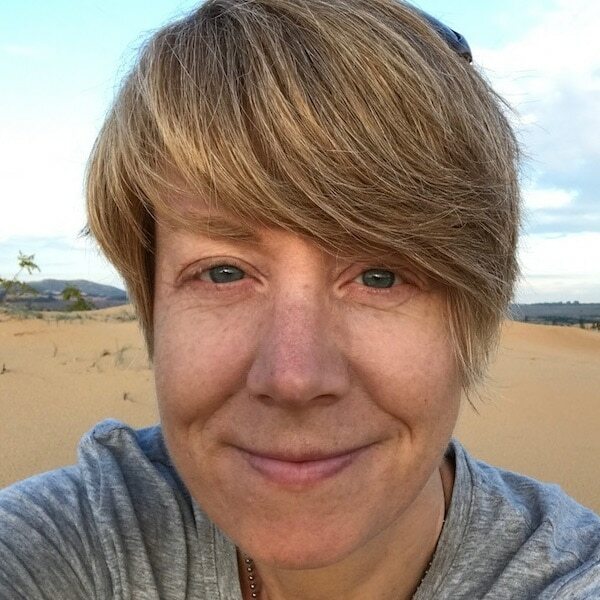 Thanks Kim – our goal is to inspire you to travel to unexpected places, so mission accomplished. We really hope to go back to Sri Lanka before too long to spend more time there! SO JEALOUS AND INSPIRED. I definitely had to look up where it was though… Google is a wonderful thing. Thanks for sharing your adventures! Can’t wait to read more and get inspired to book another flight. Thanks Jen! We were incredibly lucky to get to go – and almost completely unplanned too. Let us know where you end up booking that flight! Awesome writing! that’s totally my place :) on the list now. thank you so much for the useful insights! Thanks Isabella! If your list is anything like mine, I bet it’s getting longer by the day!